Huda Beauty Liquid Matte: These were the first liquid lipsticks that I tried and really loved because they didn't make my lips look like lizard skin! The formula is very watery but it does dry down quite quickly and because the applicator makes it easy to be precise, you don't need to worry about it being very messy. Again, I don't find that these liquid lipsticks dry my lips out further or highlight lines on the lips. I find that they last a good 7/8 hours on me before they need topping up. £18. theBalm Meet Matt(e) Hughes: I really theBalm is a brand that deserves a lot more hype - the products are very reasonably priced but the quality is top notch! These liquid lipsticks are very pigmented and the small doe foot applicator means that it's easy to be precise. They dry down to a matte finish that is flattering rather than flat. Like the others mentioned in this post, they don't feel drying on the lips and don't exaggerate any fine lines. The vanilla/mint scent is an interesting scent combination that doesn't sound like it would work, but it actually does and it dissipates after a while so even if you don't think you'd like it, don't let that put you off. In terms of wear time, I get around 7/8 hours and it can be topped up without crumbling. £15. 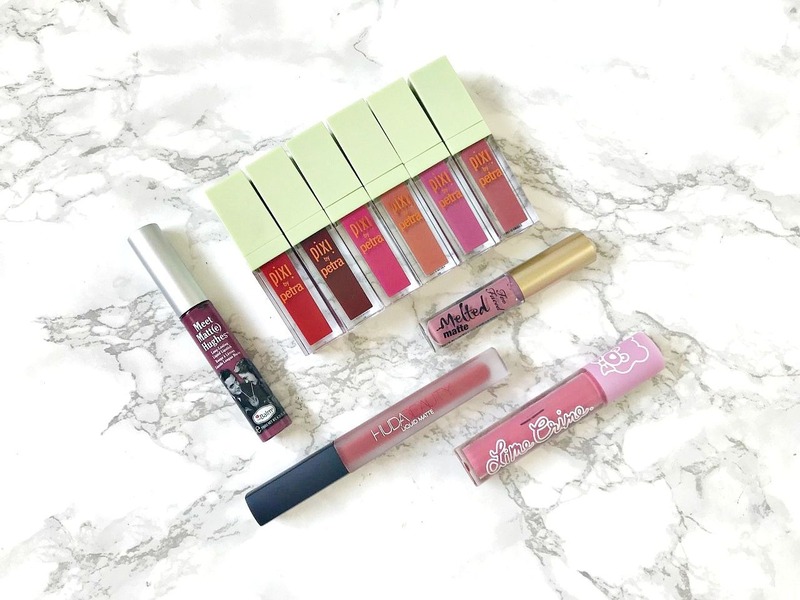 Lime Crime Plushie: These liquid lipsticks are different from the others in this post because they have a velvet matte finish, rather than a regular matte. They also take longer to dry than the others but once they do, they are budgeproof for around 6 hours. The finish isn't completely opaque, although you can layer to achieve that if you wish and they layer well but I recommend letting each coat dry before going in with the next one. If you are new to liquid lipsticks, these would be a good starting point as they are very comfortable and not completely opaque. Oh and did I mention that they smell like sweets? £18. Too Faced Melted Matte: Infused with avocado oil, these liquid lipsticks are non-drying and also seriously pigmented. Although matte, I don't find the finish to be very flat and it also doesn't highlight lines on my lips - in fact, they apply smoothly and evenly and can be topped up without the dreaded crumbling. I find that I need to top up at around the 6 hour mark. £19. Are you a fan of liquid lipsticks? What's your favourite brand? All products are bought by me, unless otherwise stated. The Pixi, Lime Crime and theBalm products were kindly sent to me. Opinion is always my own. Affiliate links may be used.